Content Marketing is a well-known way to attract people to your company’s website, services or product, but how exactly do you measure the success with these campaigns? This is a problem that many marketers and companies face, but there are real solutions! 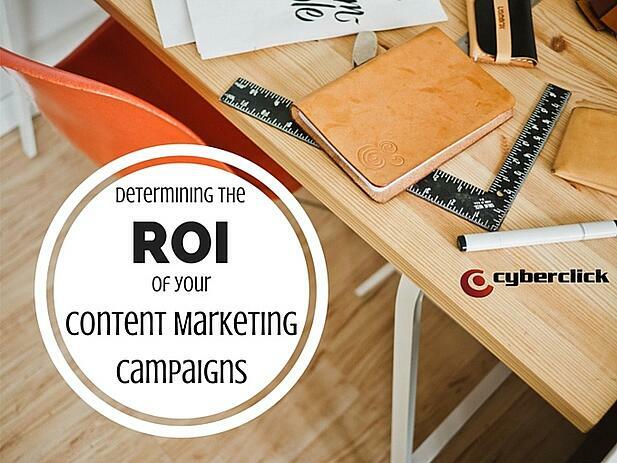 Although different companies can have various different goals when it comes to content marketing, there are many ways to determine ROI, which don’t depend on the type of goal. Some of the goals can be related to sales, brand awareness, leads, social shares, etc. but all of the different goals can be measured in the following ways! A large part of your content marketing strategy will most likely be through social networks and social ads. Paying for social ads will provide you with a lot of different metrics and results that you can use to determine your ROI based on your specific goals and KPIs. When you are just simply posting on your social networks you can also review the amount of impressions and engagements with the post but you will not obtain the same amount of data as with paid social ads. One of the main types of ROI determinants for brands is the amount of leads obtained. Leads can result in a huge sale for a business and this KPI is crucial for brands to know the success of their campaigns and investments. The issue with this KPI is that the focus is typically on increasing awareness and views, which can be very difficult to measure in financial terms. With that being said, every company is able to tract their social network campaigns with many different metrics, find the one that is most relevant to your goal and it will serve as the success indicator of your content. This tool is extremely powerful in measuring your content’s success. The amount of traffic that you receive is many times the most important piece of information for your ROI. If you want to drive paid traffic to your website then Google AdWords will need to be your new best friend. You can determine the budget for Adwords by taking the cost-per-click you see on a full report and then multiplying it by the number of organic search visitors that go to your website. You don’t have to pay, you can also use free tools like the Google Keyword Planner or WordStream to determine the best keywords for your website and then incorporate them into your content marketing. You can also use SEMRush to check the positioning of keywords and to see what is already working for your website and what you might want to change. These strategies are crucial for content marketing to actually work, every since piece of content that you produce needs to be well thought out to bring qualified visitors. When you are going to invest in Google Adwords you need to be strategic and look for the signs of a risky keyword, like if the click-through-rate is low but the keyword is really expensive. This is something that needs to be monitored daily in order to determine the best keywords to get rid of, add on or maintain. This is yet another Google tool that will be able to measure the monetary value of all of your content. In order to get started you will need to set up a dollar value in Google Analytics by either going to Goals or going to the Ecommerce Settings. By doing this through the Goals the downside is that the values are recorded only one time during each session so if someone makes a purchase various times then it would only ever be counted once. In the Ecommerce settings method these multiple purchases would be counted multiple times. The main piece of advice here is to just pick one that would work better for you goals, instead of doing it both ways. Google Analytics is a perfect way to discover the real ROI of your content marketing, but if your main goals are to increase engagement and not the purchases then you will notice that it is harder to assign a real monetary value. The key to this is to determine your goal, most important KPIs and to then determine your content marketing success based off of these factors. Good luck and keep the good content coming!